We accept American Express and all other major debit & credit cards at our shop in Whitstable High Street. 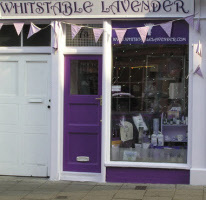 The Whitstable Lavender shop is open every day including weekends and on Bank Holidays between 10 am till 5 pm. Feel free to come and browse and take as long as you wish to discover over 400 lavender products. Many of our products are hand made in Whitstable. We now stock Greeting Cards (only available in store) which are hand crafted locally.